Australian and British POWs in Selarang Barracks square during the Selarang Barracks Incident. The Japanese had Sikh prison guards manning machine guns at the base of the administrative building in case the POWs tried to escape. This image is number 1 in a series marketed by the Far East Picture Company and originates from the Rabaul War Crimes Trials. Image taken 2 September 1942. Image donated by H. Clarke, provided courtesy of George Aspinall, Australian War Memorial. After the surrender of Singapore, a detachment of British and Australian Prisoners of War were housed in Selarang Barracks. Lieutenant General Fukuei Shimpei was the new Commander of the prisoners and in response to the recapture of four escaped prisoners, demanded that all the prisoners sign a “no escape pledge” on 30 August 1942. The majority of prisoners refused to sign as it was their right under the Geneva Convention to attempt escape if possible. Lieutenant General Fukuei Shimpei then ordered all prisoners who had refused to sign to congregate at the parade square in Selarang Barracks. 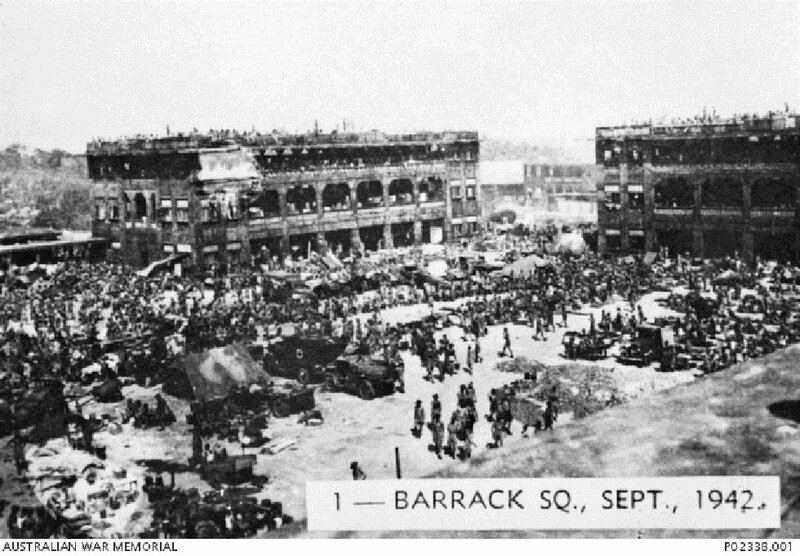 Around 17,000 men were forced to remain in cramped conditions in the parade square with limited sanitation, medical facilities, food and water in order to force them to sign the pledge. On 2 September, with the prisoners still refusing to sign, Lieutenant General Fukuei Shimpei ordered the execution of the four recaptured prisoners by firing squad. The prisoners still refused to give in until 5 September where the poor facilities took their toll and some began to die, the pledge was signed then and the incident ended. Lieutenant General Fukuei Shimpei was tried for both forcing the 17,000 men to sign the pledge and forcing them to be confined in the parade square. He also was tried for the execution of the four recaptured prisoners. This crime is well-known in history as the 'Selarang Barracks Incident' and is showcased in Changi Museum. The father of former Australian Foreign Minister Alexander Downer was interned in Selarang Barracks, and he visited it in 1996 [Sim, Susan (20 April 1996). "Downer visits father's war cell". The Straits Times (Singapore)]. Fukuei, Shimpei. Lieutenant General. From Japanese military. From Japan. Guilty. Death by shooting. Sentence confirmed. Hodgins, S.F. Major. From Australian military.